The usual method of SuxalaxTM administration is by bolus Intravenous or Intramuscular injection. The dose of SuxalaxTM is dependent on body weight, the degree of muscular relaxation required, the route of administration and the response of individual patients. 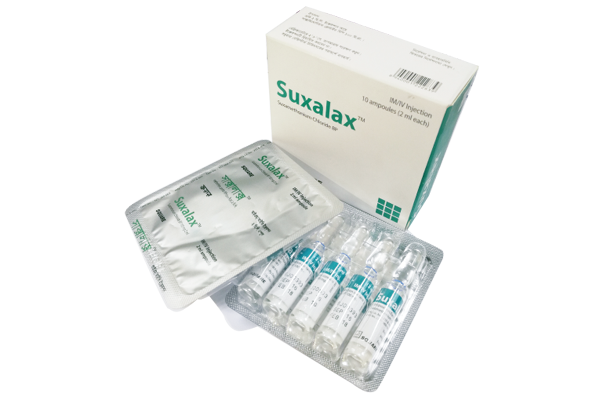 To achieve endotracheal intubation, SuxalaxTM is usually administered intravenously in a dose of 1 mg/kg. This dose will usually produce muscular relaxation in about 30 - 60 seconds and has duration of action about 2-6 minutes. Supplementary doses of SuxalaxTM of 50%-100% of the initial dose administered at 5-10 minutes intervals will maintain muscle relaxation during short surgical procedures performed under general anesthesia. For prolonged surgical procedures, SuxalaxTM may be given by intravenous infusion as a 0.1 % to 0.2% solution, diluted in 5% glucose solution or sterile isotonic saline solution, at a rate of 2.5 to 4 mg per minute. The infusion rate should be adjusted according to the response of individual patients. The total dose of SuxalaxTM given by repeated intravenous injection or continuous should not be exceeded 500 mg per hour. The recommended intravenous dose of SuxalaxTM for infants is 2 mg/kg. A dose of 1 mg/kg in older children is recommended. When SuxalaxTM is given as intravenous infusion in children, the dosage is as for adults with a proportionately lower initial Infusion rate based on body weight.SuxalaxTM may be given intramuscularly to infants at doses up to 4 - 5 mg/kg and in older children up to 4 mg/kg. These doses produce muscular relaxation within about 3 minutes. A total dose of 150 mg should not be exceeded.